Whew – I finished! This is a really long book but listening to Nelson Runger read it made it worth it. Still, it took me several months. 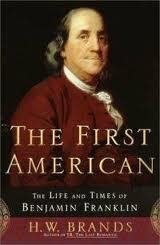 I’d been meaning to read The First American for quite a long time – I’d had it in my tbr pile for a long time. I started reading it and it took a long time (because it’s a longish book)! All well that waiting and time spent was well worth it. Brands provides a lively look at fascinating man – an authentic founding father as well as an early diplomat, inventor, author, businessman and thinker. The portrayal is fond and traditional – no revisionism here – to the point that Brands seems a bit in love with his subject. This is a great intro to the man and his times – now I can go get the negatives scoop elsewhere. Also, Runger really does an admirable job. I especially enjoyed the depiction of Franklin’s early life and the discussion on his ideas regarding the Constitution.